Thus The Uncommon Thread was born. So, try a story or two, if you don’t like them, read a few more. Because, in here, you never know what’s going to show up next. The Uncommon Thread is full of stories about everything from hunting, to Italy, to the family’s rescued pets. Not all the stories are funny. Some are poignant, such as when Dr. Anderson had to tell a patient on Christmas Day that she had cancer, and the lesson he learned on that day. Others are serious, like his opinions on healthcare and the economy. He tells a funny and sweet story about hunting with his kids. I’m quite sure none of his kids will forget that hunting trip. Ever. We have the pure silliness in “The Ghost and the Book Wright Expansions”, and in “Canine Behavior”, we learn how brilliant eight-year-olds are. I read this book in one sitting (mostly because I procrastinated, but also because it’s just that good), and in just a few hours, I smiled, laughed out loud, and cried. My ten-year-old even enjoyed the book. Or what he read of it. He hasn’t finished it yet. I gave it to him when we were stuck in our tent one evening, trying to escape the bees. He had forgotten to bring a book on the camping trip, and I had two. 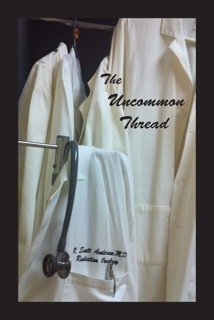 One was a murder mystery with a side of romance and the other was The Uncommon Thread. I hadn’t started either book yet, and wasn’t sure just exactly how much romance was in the murder mystery. I didn’t think a book compiled from medical journal articles would be too far out there for him to read. I hoped. I did tell him that if he read anything he didn’t understand or that made him feel uncomfortable to stop reading. He brought me one “hell” and a “damn”, but he hears worse than that on PG movies, so I wasn’t worried about it. There is one use of the f-word, but he’s quoting someone else, and my son hasn’t gotten to that chapter yet. I did have to block off one chapter for him to not read, because it’s about Anderson’s daughter discovering the truth about the Tooth Fairy, and all her fictional friends, and as my son still believes in said friends, I don’t want him reading that just yet. But he did say the book is really funny and he likes it. My favorite chapter is entitled Confabulation Nation and basically says that there are two sides to every story, none of us knows the whole of any story, and we should try a little harder to get along instead of making everything into an “us versus them” argument. What I’m trying to say, is that we should all try and be a little more understanding with each other, because we’re all suffering from the same disease, mortality. None of us has been here long enough to know the truth of hardly anything, so we should be more gentle with each other, because, we’re all doing the best we can, just making it up as we go along. There are a few minor grammar and editing errors, but nothing more than in any other book and nothing that kept me from enjoying the stories. I really only mention it because one of the errors was that in two different places, “effected” was used instead of “affected”. I find this amusing and ironic, because in the last chapter, Anderson includes some advice that an editor friend gave him, and #6 is “The spell checker will not tell you if you use the wrong word.” However, #7 is, “Leave the reader wanting more,” and Dr. Anderson has certainly done that. Author: R. Scott Anderson, M.D. This entry was posted in Blog Tour, Review and tagged Author Scott Anderson, humor, medical, short stories by Amanda Beaty. Bookmark the permalink.